Family trees are so fascinating! Don’t you love seeing the names of previous generations and where they came from? Genealogy research is a popular pastime, and though there are many software programs and templates you can use to print a family tree, nothing compares to a hand-rendered family tree designed to your custom size and specifications. 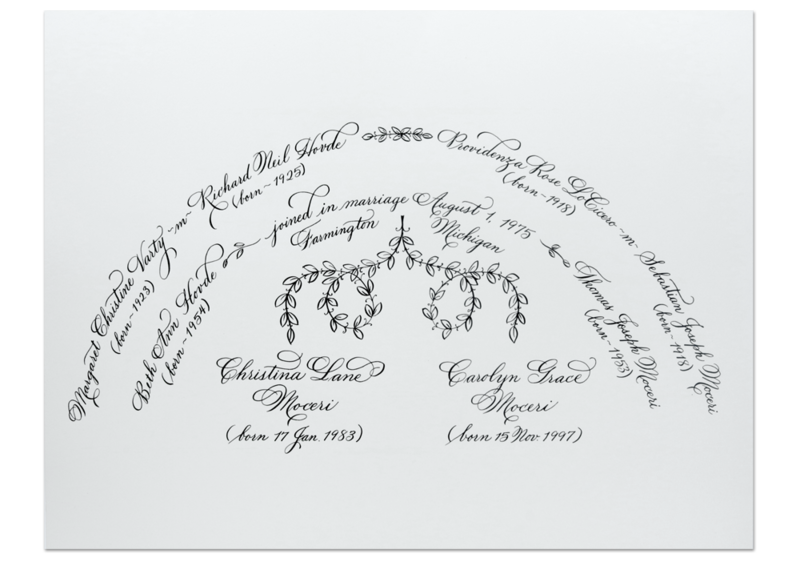 A family tree design makes a lovely wedding gift for newlyweds or any family member. The design, no matter how simple or complex, always makes an eye-catching display on a wall, and a lovely conversation piece. Please contact us to design your family tree so that you and your family can display and treasure it for generations to come! After we receive your request and confirm that we can meet your due date, we will need a 50% downpayment to start the design. Maureen will email you a sketch of the design for approval. After you approve the sketch, Maureen will ink the final design, then email you a photo for approval. Once the final design is approved, you can schedule pick up or shipping with Maureen.